Richard Short is a fan of classic films, and we mean all the classics — including The Little Mermaid. 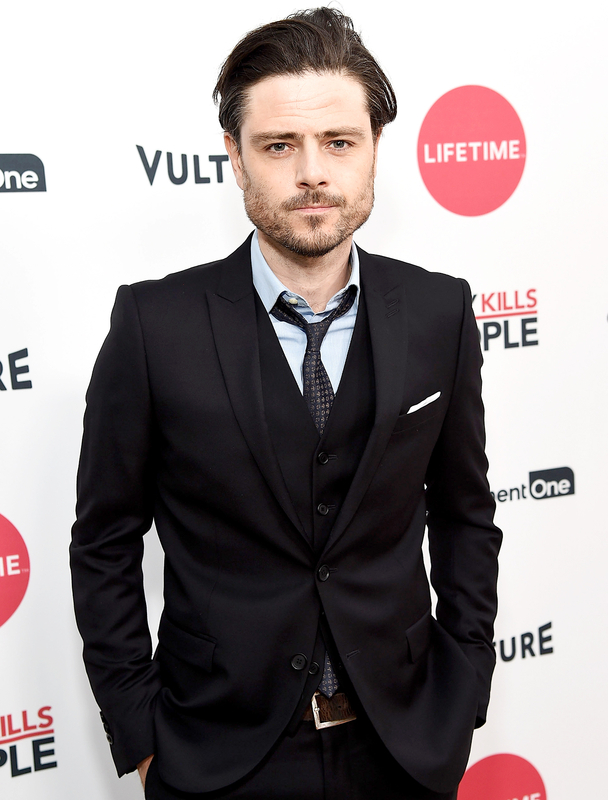 Gearing up for the Sunday, April 23, premiere of Lifetime’s Mary Kills People, the 41-year-old U.K. native shared 25 things you don’t know about him exclusively with Us Weekly. 1. I was in the movie Deception opposite Ewan McGregor but ended up on the editing room floor. Ewan and I spent most of the night talking about Edinburgh and British chocolate, though, so it was time well spent! 2. I’m approximately 85 percent chocolate. For years, medical science has been dumbfounded by the sheer volume of milk chocolate in my body … and it’s never enough! 4. While shooting Mary Kills People in Toronto, Caroline Dhavernas and I hopped a fence one night and crashed a house party. A wonderful live band was playing in the garden. It was spectacular. 5. I visited the notorious refugee camp, the Jungle, in Calais, France, last year, right before it was destroyed by the authorities to curry favor in the upcoming elections. These were some of the most hardened and most misplaced souls I’ve ever met, yet my time with them was an absolute pleasure. 6. When I finished a long run in the stage production of Grease at London’s West End and faced imminent unemployment the very next day, I found work on the backstage crew — that night! I ripped off my costume and donned my blacks to help shift the very scenery on which I had just stood. 7. I’m a founding member of the new football (not soccer!) franchise coming to Los Angeles next year, LAFC, and I wake at 4 a.m. every Saturday and Sunday to watch the English Premier League live. 8. Bond, James Bond. I’m obsessed — the films, the Fleming novels, the later books, the music, all of it. It’s the role I’d most like to perform, but I’d gladly accept being third henchman from the left just to be part of the greatest movie franchise in history. 9. I’m a Criterion Collection enthusiast. I own almost the entire library of films on Blu-ray and can explore them endlessly. Heaven in a little plastic box. The two directors I’d most like to work for today are the maestro Paolo Sorrentino and Ken Loach. 10. Disney films are something of a guilty pleasure. I have all of them too! When you’re in that mood, you can’t beat Tangled or Pocahontas. And don’t get me started on The Little Mermaid! 11. I have a staggering collection of football jerseys from all over the world. I buy them as memorabilia wherever I travel, including on a trip to Cannes for Mary Kills People. My favorites include IFK Helsinki, Japan, Peñarol of Uruguay and Colo-Colo.
12. A day without music is a day wasted. It starts with Mozart and ends with McCartney, via Chopin, Tchaikovsky, John Lennon and a bit of Abba and Piaf along the way. I can’t dance, but I’m not afraid to try. 13. I love writing and I’ve written a couple of books about the intersection between travel, football and politics. I also maintain a healthy stack of books by my bedside wherever I go. Currently it’s Prisoners of Geography and The Professor and the Madman, as I’ve finally cracked the ancient art of reading two at once! 14. I want to live for a time in every country on this wonderful planet. I’ve already lived in most major British cities, as well as Paris, New York, Toronto and Los Angeles, but feel an unquenchable desire to be a Japanese man in Tokyo, an Italian in Roma, a Cameroonian, an Australian or a North Korean. Why not? 15. I really want my next trip to be to Syria. I’ve never been a “sit on the beach and get a tan” man (as proven by my rather milky pallor), but anything other than investigating the core needs of humanity at this point feels, well, silly. 17. I attended many schools as a child. We moved around a lot, so we were constantly assimilating to new people and a new accent. Probably helped me into my current job! 18. I come from the same town as Ridley and Tony Scott, South Shields. My favorite spot is called Fishermans Bay. I think you can guess what it is. 19. I’m a card-carrying socialist and a proud atheist. I truly don’t believe these things should antagonize, which is why I mention them. Just honest personality traits. 20. While I didn’t enjoy the delights of fine single malt whiskey until about 10 years ago, I’m now making up for lost time! Good scotch or a fine Belgian beer cure most ills … before inventing their own! 21. Along with a Hamlet quote on my arm, which is often caught on camera, I have several other tattoos, including the name of a famous Beatles song on my shoulder. 22. Before any new scene, I repeat the mantra “What would Rylance do?” I’ve worked alongside Sir Mark Rylance many times, and he’s a true inspiration and a reminder to leap bravely into the unknown without a timid fear of failure. 23. Don’t ever ask me to work with mice or rats. I can’t do it! I once had unwanted mice scurrying around an apartment in London, which were remedied by a slightly less unwanted pet cat called Shymer. He was a vicious little thug. Did the job, though. 24. I used to recite Shakespeare from a small stage in the middle of Old Spitalfields Market in London. When battling the cries of butchers, bakers and candlestick makers all flouting their wares, you learn to command an audience through force of will! 25. My full name is Richard Ian Porterfield Short. Ian Porterfield scored the winning goal for Sunderland vs. Leeds United in the 1973 FA Cup Final. We’ve won nothing since. And I’m actually Richard the Third! I don’t lock up children in a tower or scream in anguish for a horse on a battlefield, but my father is also called Richard Short, as was his father before him. Mary Kills People premieres on Lifetime Sunday, April 23, at 10 p.m. ET.